Tottenham, yet again, find themselves in a state of limbo, uncertain of their future successes both on and off the field. As a fanbase, some have become increasingly disenchanted with what the club means to them, some have openly rebelled against the hierarchy in place and and others, much like myself, have taken the opportunity to reflect on the clubs’ recent history in a much wider context. In truth, for around a decade now, Tottenham Hotspur have seen their fortunes change for the better quite dramatically. It has been discussed previously, with much merit, to the extent of which relative success has brought with it the pressure to achieve more and more year on year. As fans, we can only resort to speculating as to what is happening behind the scenes at boardroom level and on the training field with limited certainty. The use of doing so, in my opinion at least, is growing increasingly futile. Conspiracy theories surrounding the ownership, or the progress in regards to stadium redevelopment, have become questions more in the realm of René Descartes than the average fan. That said, however, one cannot help but theorise how a club such as ours can capitilise on the undoubtedly good work done over recent seasons and take that final proverbial step in to sustainable on field success in the upper-echelons of the sport. Much in the same way one reveal home truths about themselves when suffering through an existential crisis, the same method of assessment can be retrofitted in to analysing an entity such as Tottenham Hotspur - the reason being, from a stakeholders perspective, is that the club is a physical representation and personification of the philosophical and ideological identifiers that are part and parcel of belonging to this club. Tottenham fans rightly take pride in stock phrases such as “the game is about glory” and feel ten feet taller when reciting Sir Bill Nicholson’s famous quote to fans of other clubs. None of that, in a purely cosmetic sense, is wrong - but what if, as a philosophy on which to build a club in the modern era, it is? What if, in a perverse twist, the ideological foundation of the club that is held so dear is actually mutually exclusive from the sustained success that is so clearly craved? ‘The Tottenham Way’ as it is known, has seen managers sacked and more playing staff bought and sold than one would care to remember - but what if that cornerstone of the club is the final trade off in gaining success in the game as it is today? This hypothesis then, raises questions that aren't easily answered, and opens up other avenues for deeper consideration. In a purely financial sense, which has to be analysed as football has become as much an industry as it is a sport, you’d be right in believing that until the club has owners whose primary objective isn't to sell, and we have a stadium in place that will enhance our match day revenue to fund a larger wage bill for the playing staff, to an extent, Tottenham will remain in this state of flux. However, when these new, currently imaginary, owners do take office, what happens if they too buy in the ‘The Tottenham Way’? Let us not be fooled, there is an overt possibility that they may begin to fund a philosophy which is at its very core mutually exclusive from success. It’s easy enough theorise and hypothesise about matters that aren’t much more substantial than mere semantics, so armed with not much more than the nucleus of idea, I sought to compare Tottenham to the clubs with which we one day aspire to replicate the successes of: previous winners of both the Premier League and Champions League. In an effort to make the task much more relevant, and admittedly slightly more manageable, I only looked back as far as ten years in to both competitions, creating an original, basic graphic for each. The reason being is, tactics become deeply tied to their place in time. The football being played across not only the country, but continent at say, the inception of the Premier League, is lightyears away from the way in which teams are set out to play now. That said, the game and tactical fads of today may not be relevant by the time Tottenham actually come to seek that step up in mentality, but not having the ability to predict the future, that’s far from a consideration. Coincidentally, should you wish to explore the tactical evolution of football in much greater detail than what I’m about to, Inverting The Pyramid by Jonathan Wilson has been reissued in to a really nice hardback. Using the last decades worth of raw data from the winners of both competitions, and then comparing them with what Tottenham achieved at similar stages in time, a picture will be painted that should show the statistical patterns involved in becoming champions in either competition, allowing us to plot just how far off course Tottenham are, and to what extent our fascination with what the Dutch called totaalvoetbal is costing us. 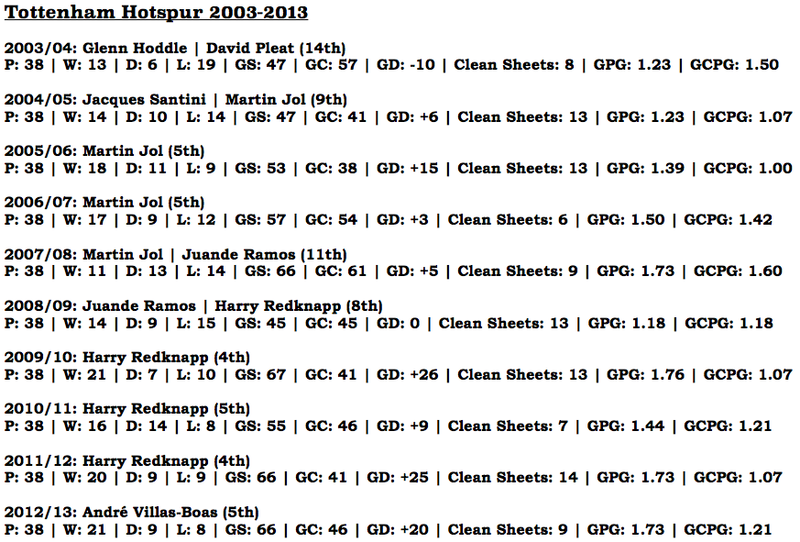 Looking at Tottenham’s record year on year over the past decade, several things immediately spring out. Firstly, having seven managers across ten seasons hardly gives off the impression of a stable enough environment to achieve a decent level of success within. Secondly, and perhaps somewhat surprisingly given our apparent wont for attacking football, our goals per game ratio is distinctly average. If we pride ourselves in playing a free flowing game so publicly, how come our goals per game average has never ventured above 2? Immediately, looking at the raw data of the past decades worth of domestic champions shows that the sides have a good balance between both attack and defence. 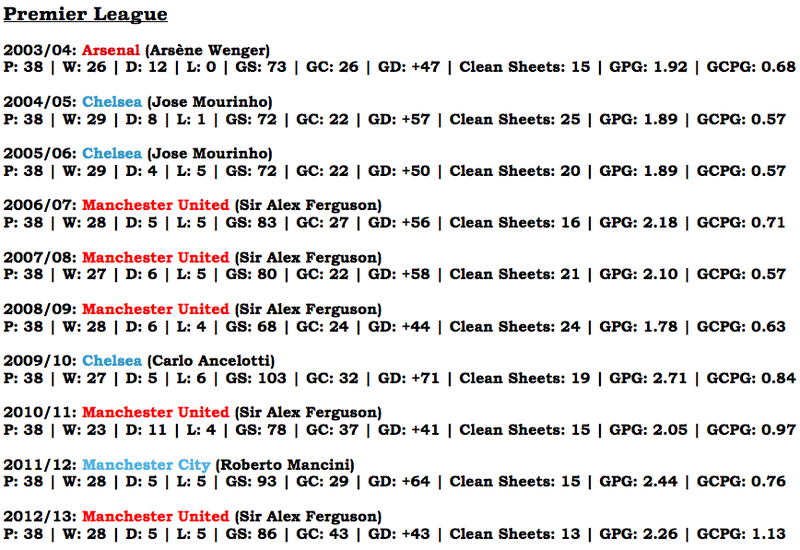 What results are inflated goal differences and higher levels of clean sheets across the season. These sides, for the most part, would also hasten to tell you that their clubs history and ideology is shrouded in purely attacking football. If they can compensate to a level where defensive ability becomes part of their identity as an attacking outfit, shouldn't that be something a club with aspirations such as Tottenham should be looking to replicate? Furthermore, through having competent defensive units as the foundation and basis of their attacking intentions, this actually allows the team to control more of the game and consequently score more goals. In the past decade, the lowest amount of goals a championship winning side has scored is 68 by Manchester United in 2008/09 - Tottenham’s highest total in the same timeframe is 67 in 2009/10. 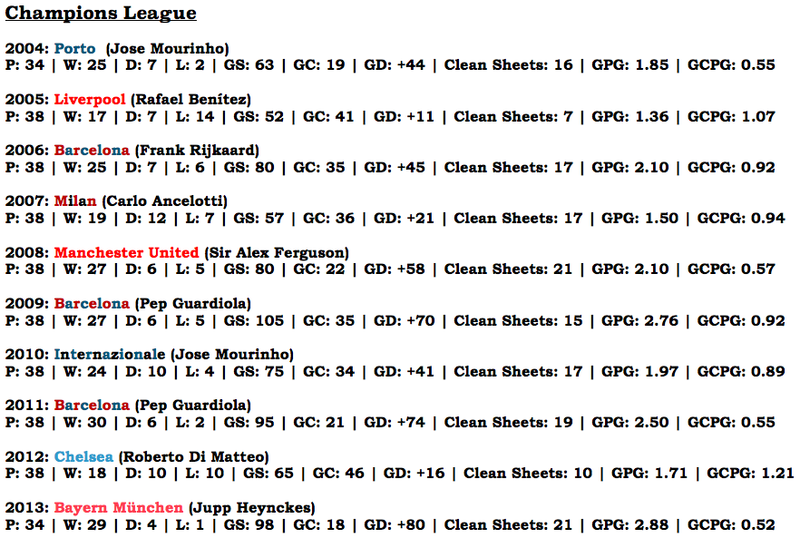 Tottenham’s highest goal difference in the decade is +26, which looks laughable when compared to the +41 Manchester United got in 2010/11 which was still enough to win them the league, though the lowest a championship winning side achieved over the decade. Aspirations to win the league are all well and good, but when the manner in which we’ve played our football contradicts not only statistically the most successful means of operating, but the clubs own supposed brand of glory football, the possibility that ‘The Tottenham Way’ could perhaps be a disillusion of grandeur become somewhat unavoidable. To win the biggest prize in European football, we’re told unequivocally that the team that plays the best brand of attacking football usually wins. A theory undoubtably aided by the success of a tiki-taka inspired Barcelona side, the data tells a somewhat different story. Firstly, however, the use in the comparison between Tottenham and the winners of a competition which is perennially out of our reach may seem slightly forced to begin with, but if we allow ourselves to take in to account the method football teams have adapted on a stage where ‘The Tottenham Way’ is expected to flourish the most, we may reveal as much about our ideology as we had done looking at the teams above us domestically. These sides, thankfully, give a slightly more varied story to their success than what the Premier League analysis had done, which makes perfect sense given the knock-out nature of the competition they have won, which again feeds in to the notion that Tottenham might perhaps be a ‘cup team’. The most interesting point to be found within this specific set of data is from the sides goals conceded per game ratios. Apart from two anomalies, which we’ll come on to, each side that had won the competition doesn’t concede more than a goal a game - a feat which Tottenham haven’t replicated once in the past decade. The anomalies, interestingly enough, are both English sides too, which means we have a better idea of how they were performing at the time. Liverpool in 2005 were hit and miss domestically, but due to their managers ability to organise them correctly in Europe, both offensively and defensively, and an admittedly fantastic penalty win in the final, they somehow concentrated their focus on to the one competition. The next anomaly, Chelsea in 2012, affected perhaps the most ultra-defensive model possible to win the cup, which was a perfect juxtaposition of what ‘The Tottenham Way’ is supposed to be. While affective in a cup competition when married with unprecedented levels of luck, their domestic form was abysmal in comparison. To punctuate the cliche that ‘there is more than one way to skin a cat’, the winners the year after, Bayern München, played an attacking game built on the foundations of an even more impressive progressive defence, being perhaps the greatest example available that prioritising one facet of football above another is ultimately flawed. 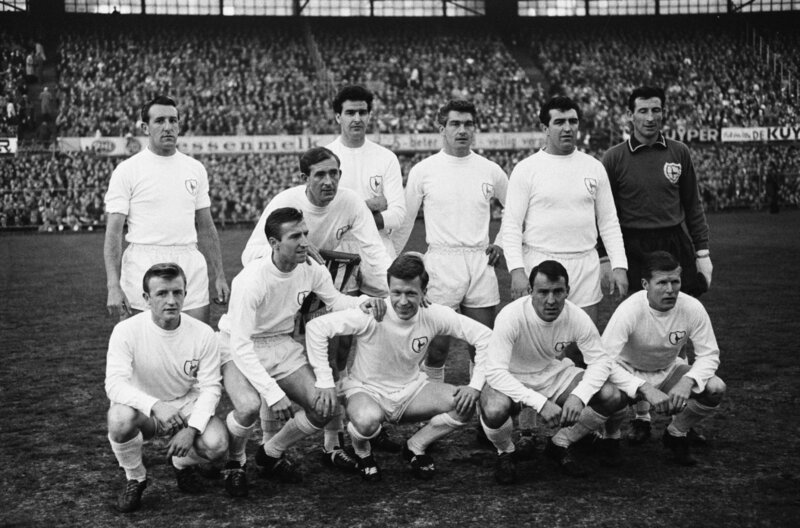 This, before the accusation is raised, does not mean that Tottenham should begin an overhaul of history and tradition in order to become a more defensively orientated side in the search for success. Hopefully, rather, the understanding of football in a greater context and how success is achieved might place more patience within the club at both board level and for the fans in preparation of the next management unit that tries to promote a more contemporary and pragmatic approach to modern football. ‘The Tottenham Way’ should never be abandoned, and I would never want it to be. Attacking football and having the strength in your convictions to prioritise it as a means to an end should be celebrated, but we must concede that unless we wish to forever fall short of our on field aspirations, there has to exist a marriage between the traditions of the club and an appreciation of the defensive aspects of modern football. You can play pretty football, and you can vow to attack for every second your side is in possession, but unless that is protected by a competent defensive unit and an understanding that on occasion, containment is as important as expansion, you will get the footballing equivalent of running before you can walk. ‘The Tottenham Way’ is a philosophy covered in dust, requiring only time and patience to be polished and adapted upon for the current footballing climate. When that change is allowed to happen, and only when it is supported and understood by everyone from the chairman to every last supporter will it truly be allowed to flourish in a modern context.